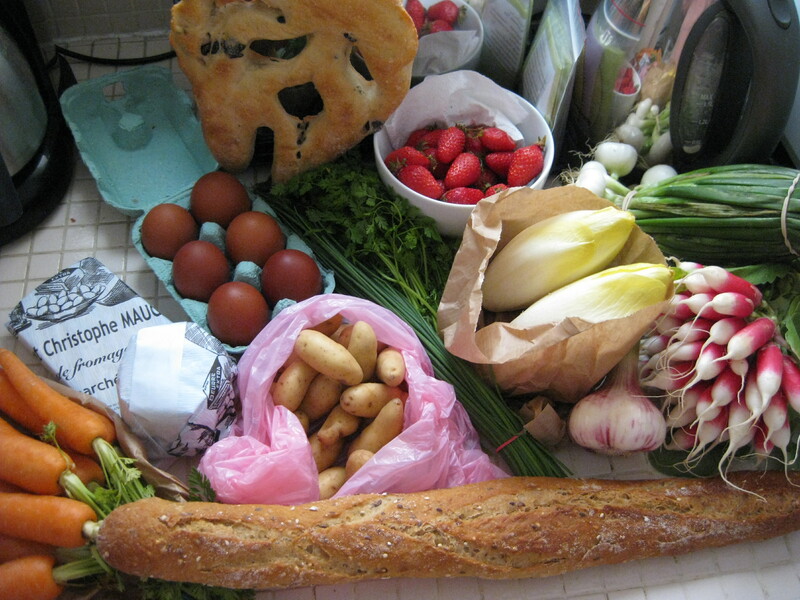 A friend a week or two ago via Facebook asked if I was going to be doing any cooking during this month in Paris. That really wasn’t part of the plan. It’s a lovely but small apartment with a tiny kitchen, two burners and a “combo” microwave oven (though it really seems just microwave to me). Not suited to lots of cooking. I love to cook, don’t get me wrong. I’ve been taking advantage of the kitchen for simple meals/snacks, primarily morning yogurt with fruit, afternoon/evening salads, cheeses, etc. But nothing beyond that. Until today, I hadn’t turned on those burners. And I guess three weeks away from the stove was my max. Granted, I’m not doing any seared duck breasts with port reduction or anything. But I did soft-boil a couple glorious eggs from the morning market, with some bread and a nub of butter…oh, it was so very good for a post-market breakfast! My purchases today were a little hap-hazard, on whim. Buying strawberries, I also glanced at the bin of small potatoes that caught my attention. They were the La Ratte variety, a wonderful nutty, dense little potato that’s just delicious. 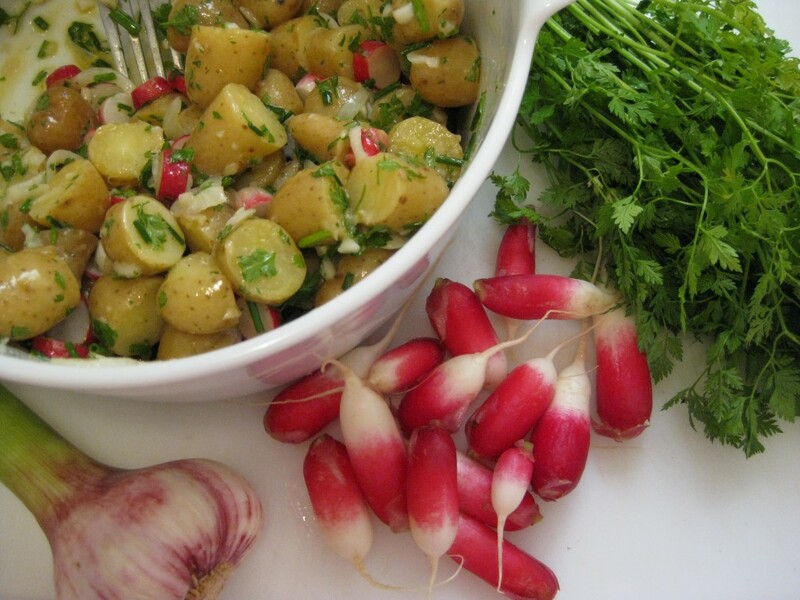 And I seem to be addicted to radishes, more of them too. And LOVE Belgian endive, two heads please. Had yet to bite into a morsel of pâté, got some with green peppercorns, and while I was at it a slice of jambon persillé (ham layered with aspic that has lots of parsley). No question I’d get some cheese, brie de Meaux, a lovely rich cantal, some chevrot goat cheese. And bread, can’t forget the bread, to change things up got some whole-grain baguette and an olive fougasse to nibble on at aperitif hour. What else…herbs, carrots, some fresh garlic, young onions. My mini-fridge looks pretty bountiful right now. Guess it felt good to be cooking again, even at this minor degree. After the eggs were done, I refilled the pot with cold water, added those potatoes and set them simmering. 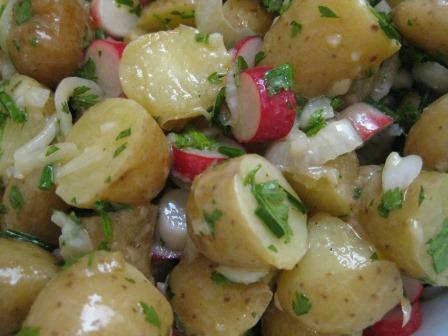 The end result is this simple, fresh, delicious potato salad inspired by my market-day haul. After it rests another hour or two, it’ll be delicious for a late lunch accompanied by that pâté, a bit of cheese, some carrots. Oh, and what the hell, maybe a glass of the Côtes d’Auxerre wine sitting on the counter. It is Sunday, after all. ** Please note that because this was an at-whim recipe created in a tiny kitchen I’ve never cooked in before and without my typical equipment, the times and quantities are my best-guess to retrace my steps. But the nice thing is, you can’t go too far wrong with a recipe such as this. As always, feel free to modify as so inspired. Put the potatoes in a pan of cold water and set on high heat to bring the water to a boil. Reduce the heat to medium and simmer until the potatoes are just tender when pierced with the tip of a knife, about 15 minutes. While the potatoes are simmering, combine the mustard and vinegar in a medium bowl and stir with a fork to blend. Add the olive oil with a good pinch each of salt and pepper. Stir vigorously until well blended. Add the onion and garlic and stir to mix.